Look featuring Chanel Rouge Allure Velvet lipstick in 'La Sensuelle'. Eyes feat Make Up For Ever Aqua Cream in #13 & #17. I have a love/hate relationship with Matte lipsticks. I love to hate them. Matte lipsticks usually feel like trying to rub a dry stick on my lips. While the color usually looks nice, they tend to dry out my lips and look very ‘chalky’ or worse, ‘ashy’. And God help you if you haven’t exfoliated your lips. If not, matte lipsticks will usually show up every crack, dent, split and flake on your lips to the power of ten. Not good. 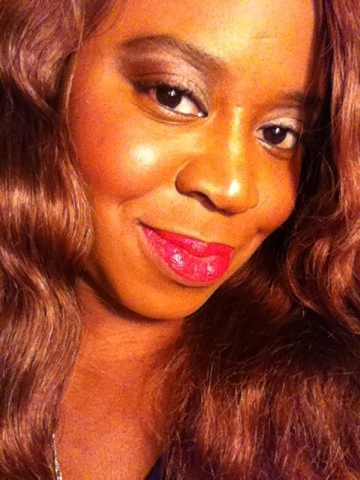 Which is why I was so excited to try Chanel’s Rouge Allure Luminous Velvet lipsticks. 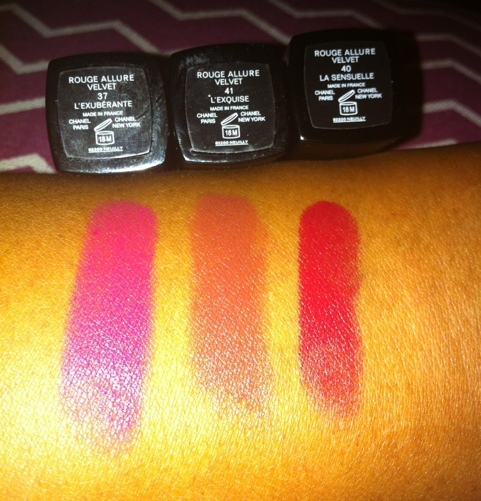 I’m a huge fan of the Rouge Allure Satin lipsticks due to their intense pigmentation (an awesome thing for women of color), the elegant ‘click’ case and a color range that goes from the professionally practical to in-your-face crazy with ‘class’. The same size as their shinier sisters, they are priced at $32 USD and are available in eight (8) shades. I’ve swatched seven (7) of those which caught my fancy though frankly all of the shades are beautifully done. L’Exquise is a beautiful brown that I feel works amazing on women of color–especially for conservative offices and job interviews. L’Exuberante (which I wear in my MAC for Miss Piggy post) is a bold fuschia pink that rivals that of NARS Carthage matte lipstick. La Sensuelle is a strong blue-red that adds an interesting twist to the usual red lip. Rouge Allure Luminous Velvet lipsticks go on very smooth and creamy. The pigmentation is very rich yet even with the more vibrant tones the color is intriguing rather than shocking. There is some ‘drag coefficient’ but nowhere near what I’ve experienced with some other matte lipsticks. Unfortunately the longevity of the color isn’t as long as it is with the Rouge Allure Satin formula. I did notice a fair amount of lipstick fade after a meal and after a cup of Starbucks but it is a gradual one. Still, considering this is a luxury product, you need to decide for yourself if you want to drop $32 on the unique finish or go with the longevity and standard look of the Satins. I personally think grabbing one is a nice changeup for your makeup wardrobe if your budget allows. 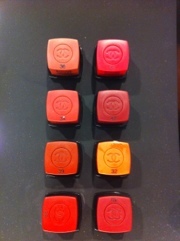 You can purchase these at Chanel counters in upscale retailers such as Neiman Marcus and Nordstrom, and on Chanel.com. In-store display of testers for Chanel Rouge Allure Velvet lipsticks. 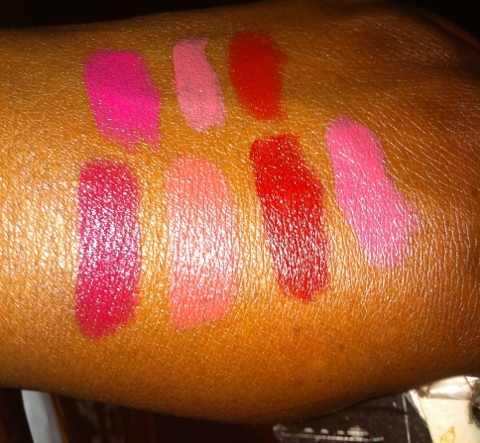 In store swatches of Chanel Rouge Allure Velvet lipsticks on NW43 skin. Top row: L'Exuberante, La Celine, La Somptueuse. Bottom row: La Sensuelle, La Ravissante, La Fascinate, La Rafinee. The ones I purchased: L'Exuberante, L'Exquise & La Sensuelle. All swatches on NW43 skin tone w/ flash. My 'church lady' look feat. L'Exquise Chanel Rouge Allure Velvet lipstick. Eyes feat. 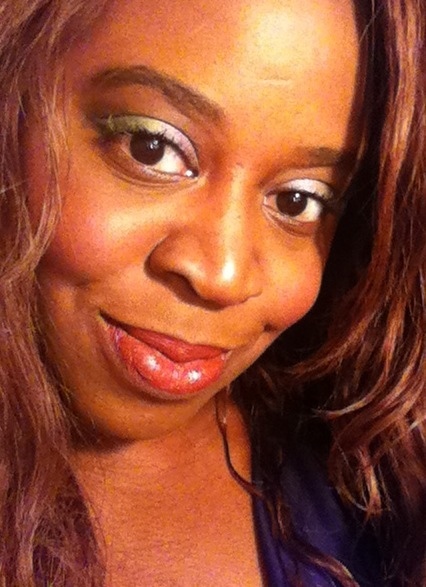 the Balm 'Cast Your Shadow' Muppets palette in Curtain Call & Woman Woman.